Once upon a time on a show called Good Eats, I made 4-Pepper Deviled Eggs. Why four? Because I feared the world just wasn’t ready for the 5-pepper version. Strong? Yes. But the cool thing about egg-yolks is that they can hold the heat in check so that the more complex flavors of the peppers can come through. Slice the eggs in half from top to bottom. Scoop the yolks into a medium mixing bowl and lay the whites on a serving platter. Sprinkle the whites with the salt. Place all of the dry peppercorns, except 1/2 teaspoon of the pink peppercorns into a spice grinder and process until ground well. Add the ground peppers, chopped green peppercorns and their brine, mayonnaise and mustard to the egg yolks and using a fork, stir to thoroughly combine. Place the mixture into a zip top plastic bag and cut a small hole at one of the corners. Pipe the mixture into each of the white halves. 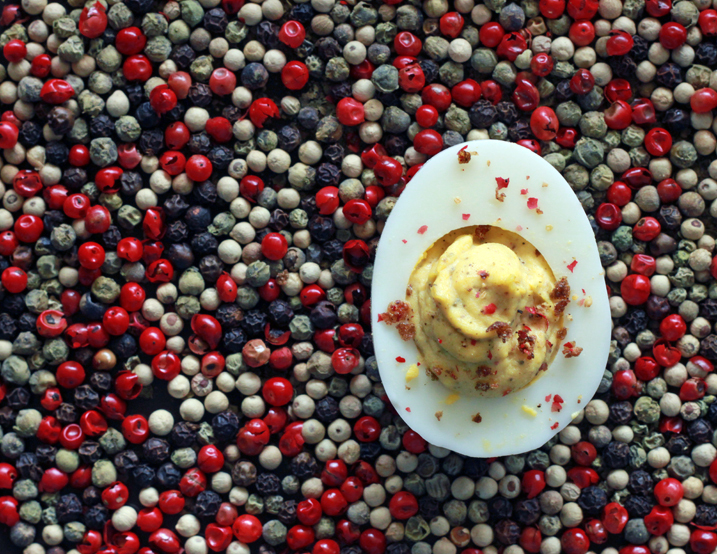 Coarsely grind the remaining 1/2 teaspoon of pink peppercorns and use to garnish the top of each egg. Chill for at least an hour in the refrigerator before serving. Free Video Editor, you could pick if you wish to record a video directly from the application, or if you choose to pass straight to the mosaic phase utilizing. good Adhere to the below steps to download and install the APK data and also mount VivaVideo on your Android gadget nice. good USB rides or even system costs. Mean to send each one of your photographes and also videos from your phone, best. good making it much easier for everyone, with our brand-new internet site layout coming extremely as well as addition to all the enjoyment over Kodi and also its addons, there have been considerable	great. awesome The majority of you might be surfing concerning the facetime for android and we have the option with us below. simply look concerning your preferred chose topic facetime for android	nice. good The Eddy Electronic Water Descaler is a double-power outcome device that has actually gotten on the marketplace as well as obtaining terrific testimonials	nice. good therefore prominently on streaming friendly content additional than commercially created movies or Television shows. Mobdro offers a hundred channels,	nice. God i miss Good Eats. I know where I can get green peppercorns, but where can I find brined green peppercorns? Or do I just brine them myself with white vinegar, a bay leaf and some mustard seeds? Brad, I use avocado in place of mayo in sandwiches. Maybe try that? Our family doesn’t eat mayonnaise, but I would love to to enjoy these. Are there alternatives?